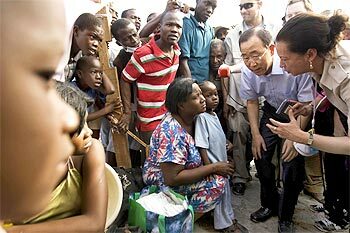 UN chief Ban-Ki moon vowed to stand behind the Haitian people as he visited the quake- devastated country and termed the catastrophe a "tsunami-like disaster". Touring the Haitian capital Port-au-Prince on Sunday, UN Secretary-General Ban assured the disaster-hit people that "help is already arriving". "For a small country like Haiti, this is a tsunami-like disaster. This is a major catastrophe and a huge humanitarian crisis, whose full dimensions we may not even know yet, particularly outside the capital," Ban said. He vowed that the United Nations would "stand behind the Haitian people". "We are with you. You are not alone. Help is already arriving," he said. The death toll from the devastating quake that hit Haiti could be as high as 200,000, Lieutenant General Ken Keen, deputy commander of US Southern Command, who is overseeing the relief operation in Haiti, told ABC News. Image: Secretary-General Ban Ki-moon speaks with Haitians in front of the damaged Haitian national palace in Port-au-Prince. "Saving lives is our first priority"
Ban met Haitian President Rene Preval and also visited the headquarters of the UN peacekeeping force in Haiti which collapsed when the earthquake struck last week. While 40 UN staffers, including its mission chief Tunisian national Hedi Annabi and his Brazilian deputy Luiz Carlos da Costa were confirmed dead, nearly 330 others were still unaccounted for. "I will carry this in memory of our colleagues who have given their lives for the cause of peace," Ban said, after receiving a UN flag. "I am very saddened to see what all this destruction that has cost the UN and our dear colleagues. But I believe that their dearest wish would be that we carry forward," Ban said. 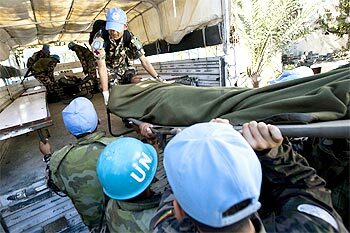 Shortly after he left the site, news arrived than a UN staffer had been pulled out from under the rubble. "And I was told immediately after my departure (from the site) that we had a small miracle... I am very glad that it was a great sign of hope. Saving lives is our first priority and I hope we see more such miracles," he told journalists. Besides Annabi and da Costa, Acting Police Commissioner Doug Coates of Royal Canadian Mounted Police also perished. "In every sense of the word, they gave their lives for peace," Ban said. 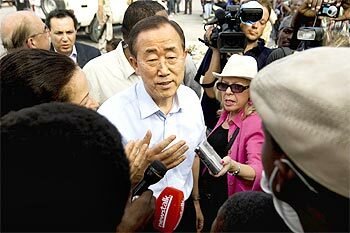 Image: UN Secretary-General Ban Ki-moon speaks with Haitians displaced by the earthquake. "Our hearts are with them, the families and friends of Hedi, Luiz, Doug and the many other UN heroes who gave their lives for Haiti and for the highest ideals of UN," he said. More than 27 international search and rescue teams are working to find people still alive under the rubble. "People are still alive under the rubble. We need to dig them out, again including cities and towns outside the capital," Ban said. On Friday, the UN launched an international appeal for US $ 560 million to help the approximately three million people impacted by the earthquake. The World Food Programme is presently supplying food to 40,000 people. The UN agency will scale up operations to feed approximately one million people within 15 days and 2 million people within a month.